Home Articles Back in the game…. I fought it at first by trying to convince this friend how much time I spend maintaining two web sites and a section of a third one coming up in October. I also added details about the fixed time I set aside every week to promote three TV shows. And I did not leave out all the consultant work for the firearms industry who is so heavily involved in all we’re doing…. On top of all this, I have to spend time on the telephone. There is no time left! I agreed, but of course, in a way that wouldn’t make him think I thought he was a pain in the…. oh, well….. Anyhow, he convinced me. Now, before Michael Bane and I joined forces, I wrote pretty much regularly about current events and happenings. Not that I blame Michael for ruining my writing career, it just became a lower priority when we decided to build the logistics around what we are involved in. Well, maybe now is the time to get back into the “writing game”. I will promise you at least one weekly column where I simply wrap it up before the weekend. Most people know me as a cowboy action shooter and dedicated to this sport only. As a competitive shooter, that is my priority. My professional focus is a whole lot broader than CAS. Believe me, cowboy action shooters in general also represent the average gun owner out there and they are also involved in other shooting sports, hunting and Second Amendment issues like every body else. So don’t worry… this column will be about a lot more than folks wearing cowboy hats and single action revolvers. 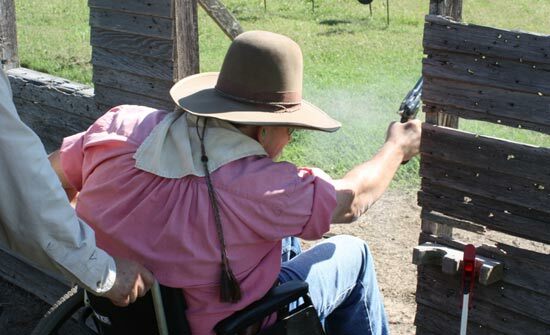 This week’s main topic is indirectly related to cowboy action shooting, but is in fact more about people, dedication and what I call the backbone of the shooting sport. A few times a year, I grab my guns and gear to go visit a local shooting range. Between 5-10 shooters show up at this range twice a month to shoot 6 stages with their cowboy guns. It is not really an official shooting club, just a group of people who meet to compete with a low key attitude. I love going there, because it reminds me of the times before I got involved in national and local organizations and all the politics that comes with it. It also reminds me that what we are doing is about camaraderie and the fact that shooting sports is mostly about the average folks, not the elite and the top shooters. Most of all, it reminds me that if it wasn’t for the local dedication, we would not have a shooting sport to organize on a national level. And this also brings me to a man answering to the alias Henry Logan…. Henry is not the person you’ll find traveling to all the neighboring clubs, competing in state or national championships. He is depended on a wheel chair. His disability limits his speed, but his strength and determination are the keys to accuracy and dedication. He is also the ramrod, the organizer, the person who makes it all happen. Twice a month, he sets it all up on paper. The stage descriptions and the results are all taken care of. All we have to do is to show up, set up the targets, shoot the match and take the targets down. Henry never complains, his 44-40 rounds are packed with heat and they are far away from the gamer loads many of us send down range. Henry competes with himself, but at the same time, he makes it possible for us to compete on whatever level we want to compete in. Henry does not take things for granted the same way as we do. While we in other settings might complain about stupidities, how things can be organized better, how rules should be changed to level the playing field, he just don’t care about these things. His goal is to participate in the game on his level and without any concerns about his limitations. On top of that, he wants to share the game with the rest of us. Henry is a good example of the unselfish attitude we so desperately need to keep the machine running. With or without wheelchairs, there are many people like him out there who do a lot more than what can be expected. Henry represents the backbone of the shooting sport. Without people like him, we would not have a platform to keep the local clubs running. Without people like him, the national organizations would simply vanish, the top shooters would no longer be able to receive their awards. The next time you watch a fast shooter, the next time you hear about a firearms company sponsoring a new talent, don’t forget the Henrys out there, who makes it possible for the rest of us…..
Henry, thanks for all you do and for reminding me what the shooting sport is all about. ’ll add my THANKS to you too Henry. You are part of the reason I have finally started shooting in matches. You are an inspiration to all who have watched you shoot and who are privileged enough to know you and call you “friend”..
As one of those “Henry’s” for 5 years, often the simply enjoyment of those around us is enough to keep us going… a “thank you” is like a 12-volt battery on a 6-volt starter..
A coupla “Henry’s” in a club is like throwin’ gasoline on a grass fire in a 40mph wind… there just ain’t no stoppin’ ’em! Ya can’t say “THANKS” enough, but once in a while, it’s all the fuel one needs.